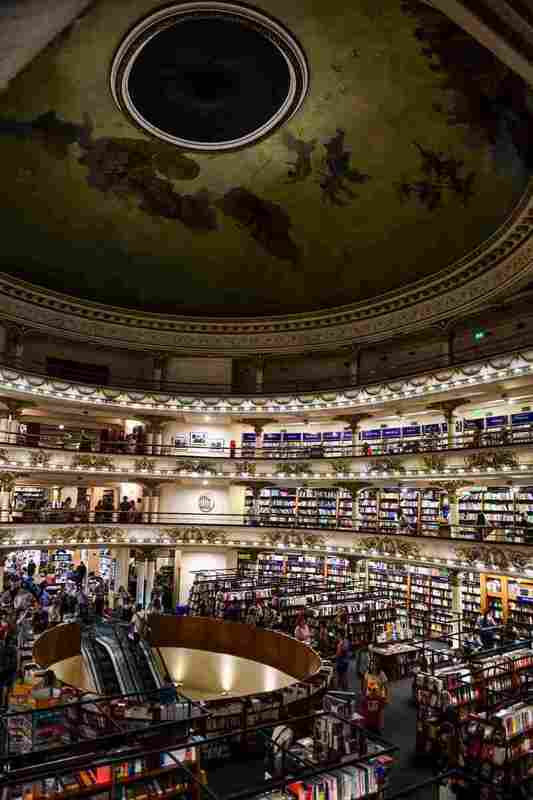 Inside 'The World's Most Beautiful Bookstore' In Argentina National Geographic has named El Ateneo Grand Splendid the top shop in the world. But that's only where the history of the 100-year-old Buenos Aires building, once a palatial theater, begins. 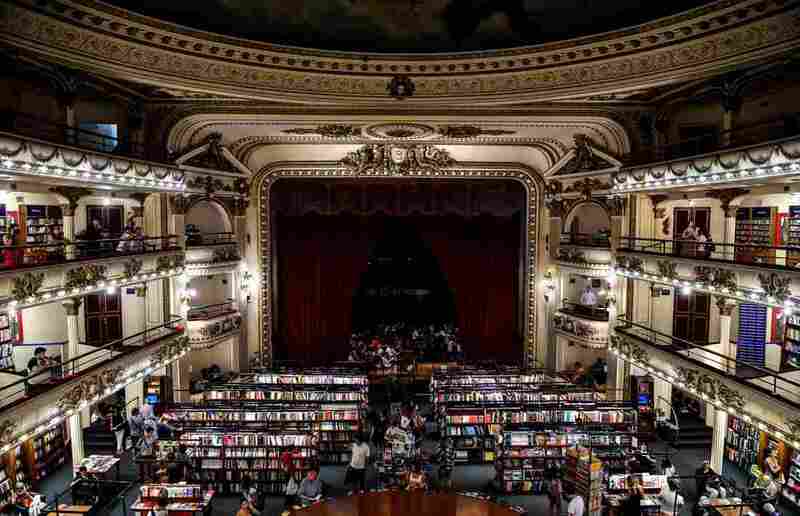 When the Gran Splendid Theater in Buenos Aires was converted into a branch of the Ateneo bookstore, the stage became a cafe. It was just named "the world's most beautiful bookstore" by National Geographic. In its first issue of 2019, National Geographic named a shop in Buenos Aires, Argentina "the world's most beautiful bookstore." NPR was ahead of the curve. Bob Mondello filed this report 18 years ago, shortly after the Teatro Gran Splendid was converted into El Ateneo Grand Splendid. Impresario Max Glücksmann wanted his new theater, the Teatro Gran Splendid, to remind people of the Paris Opera. He had it built in 1919 with three ornately decorated balconies hugging the back wall of a 1,050-seat auditorium. It's decked out with gilded statues, marble columns and a ceiling mural celebrating the end of World War I. In the days before air conditioning, the domed roof opened in good weather to give theater audiences a glimpse of the stars. It is a spectacular space. After a $3 million renovation, it's no less grand than at any time in the decades since it was built. There is one difference today. Where once the vast auditorium was filled with rows of theater seats, it now has rows of bookshelves. The Gran Splendid has been converted into what is quite possibly the most spectacular bookstore on earth. The transformation is the brainchild of Adolfo de Vincenzi, who has loved this theater since his student days and still recalls films he saw here (one of them being "a movie of Liv Ullmann and Ingrid Bergman, Sonata Otoñal [Autumn Sonata]") whenever he could take a break from his accounting classes three blocks away. "Every time I finished with my exams, I said, 'That's my vacation,'" de Vincenzi said. "I came here." The theater that now houses El Ateneo Grand Splendid bookstore had a domed roof that opened. The Gran Splendid was seriously run-down when it was acquired by de Vincenzi's company El Ateneo, a bookstore chain that is akin to Barnes & Noble in Argentina. The theater had succumbed to the same trend toward suburban multiplexes that has made downtown movie palaces obsolete in the U.S. So when de Vincenzi heard the lease was available and looked around at what was happening to other theaters that once lined the nearby avenues, he says he didn't have any second thoughts. "We didn't decided to stop with this building being a theater," de Vincenzi said. "Business made that it was not profitable ... so what we did is put a bookstore instead." He noted that two other cinemas once located a block away have now become parking lots. Because this particular theater was an architectural treasure, the Ateneo chain had some trouble at first with City Hall. But opposition melted away when the public got a look at the refurbished Ateneo Grand Splendid — brighter, cleaner and with plenty of activities to guarantee that it would still attract crowds. New uses were found for almost every inch of the building. The broad stage that was always there behind the screen is now a bustling cafe. The orchestra section and first balcony are packed with bookshelves. And the box seats, once the most expensive in the house, have been outfitted as private reading rooms with cushy armchairs and a great view. The top two balconies, which look down on all this, have been turned into a branch of an art gallery [note: closed in the years since this report], filled with colorful paintings and sculptures. And past the art, way up near the ceiling dome behind a locked door, there's something the public doesn't see: the room where tango singer Carlos Gardel made some of his first recordings. De Vincenzi leads the way up winding stairs to a broad, high-ceilinged, acoustically boomy, wood-floored room. It's located above the stage. He explains that this is where Gardel recorded. "It was really the only use this floor had," de Vincenzi said. "It's a kind of magic, this place." Gardel is only the most famous of the artists associated with the Gran Splendid. During the theater's early years, Glücksmann started his own radio station that broadcast from the building. International ballet companies and theater troupes played here, and for decades it was one of the city's premier movie houses. So it's not surprising that in its new incarnation, it's the in-spot for visiting authors, who flock to the stage cafe for book signings and discussions. That's not to suggest that the dramatic arts are no longer represented at the building. In fact, for many years there was one actor who was present here every day, though not on stage. Natalio Povarché, whose art gallery commands a terrific view from the top two balconies, appeared in more than a dozen Argentine films, so he feels right at home in this theater. It's especially true, says his daughter Mariana, because it was here that his very pregnant wife dragged him to see Cat on a Hot Tin Roof one fateful day some 42 years ago. Midway through the screening, her mother went into labor. But she refused to go to the hospital immediately. "And she said, 'No, I'm not going to leave the cinema until I see the very end of the film,'" Mariana Povarché said. "When the very end came, she was feeling really very, very bad. And his neighbors [told] her not to wait [for] a taxi. He was going to take both of them to the hospital. Because if not, I was going to get born here." She now feels she's been reborn here, in an artistic sense, working in her father's gallery even as she advances her own acting career. Because her mother is an astrologist, she laughs that the stars must have had a hand in bringing her back here — the stars that audiences could once see through that open dome (and that can also be found on the astronomy shelves on the right side of the first balcony or the astrology section on the main floor). Does Mariana miss what once was here? Of course, but she notes that the old mix of performing arts has been replaced by a new mix that also has value. "You can have your coffee right on the stage — on the real stage — and while you're reading or having your coffee, you can see the paintings from downstairs," she said. "I think that it's very magic. And it's a privilege to be in a place like this — a very, very special place. I don't know if there's another one like this one in the rest of the world." Patrick Jarenwattananon adapted this archival story for Web in 2019.